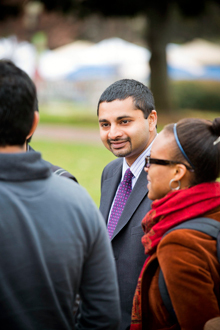 Ajay Nair, senior vice president and dean of Campus Life. Emory Photo/Video. Listen to Ajay Nair describe his vision for the 2014-1015 academic year, and it all comes down to a central, unifying theme: create and strengthen community. Whether he's revealing plans to renovate Dobbs University Center (DUC) as a gathering place with collaborative space for everyone, the launch of a new Center for Diversity and Inclusion, or discussing efforts to build living and learning communities within residence halls, the goal is bringing people together. "So much of what we do is about the push for building community across perceived boundaries, ensuring that every student has a sense of belonging," says Nair, senior vice president and dean of Campus Life. "Everything is intended toward that goal, helping students to be successful and feel a sense of belonging and ownership." The blueprint for achieving that is outlined on a whiteboard that will remain on display in his office throughout the entire academic year — a can't-miss-it reminder of the important work that lies ahead. This year, Nair has divided his ambitious to-do list into several broad-based challenges, each peppered with an abundance of what he terms "opportunities." At the top of the list is creating a highly collaborative division, "along with a highly collaborative university that aligns with President Wagner's vision of moving from a multi-versity to a uni-versity," Nair says. One of the most visible examples will involve public forums to help plan for the DUC renovation, which enters the schematic design phase this year. "In terms of space, the DUC will provide us with the kind of collaborative opportunities our community yearns for — a gathering place where all community members can converge as one, as a university, as a community, where we can share our experiences and grow together," he says. Other goals will involve unifying Emory's recreation programs and facilities to create holistic options for the larger campus community and further aligning the PreHealth Mentoring Office and Career Center to assist students. The Emory Bubble, a social media platform designed to be Emory's official campus life network, is also making a comeback, and both Nair and Campus Life are already using it to share information with the community. Another key focus will involve communicating high expectations for student learning "congruent with the ethos of Emory," and that will take many forms, Nair says. The newly launched Center for Diversity and Inclusion unites offices including the Center for Women; the Office of International Student Life; the Office of Lesbian, Gay, Bisexual and Transgender (LGBT) Life; and the Office of Multicultural Programs and Services. The center is now under the interim direction of LGBT Life Director Michael Shutt, who is "helping us organize resources and services to help meet students where they are and help prepare them for life beyond Emory," says Nair. "Our students come to campus with multiple identities, so it is important for us to recognize their great diversity and foster learning through the many intersections and differences that exist within our community," he explains. "We're blowing up the traditional models in higher education in an effort to meet the needs of our student community. It's a radical approach to the work because it views culture as fluid and porous, balanced with the need to affirm identities to support student growth and development. "Our new model will help us take the next step in helping students realize the deep intersections that exist among all of us," he adds. Students will also have learning opportunities through participating in exercises in open expression and civil dialogue around controversial issues through campus debates hosted by the Barkley Forum and Eagles Speak, a program launched last year. For the first time, Emory will also host a Greek Life Summit during homecoming, which will convene students, alumni, faculty and staff to plan for the future. "As President Wagner says, we're not trying to create Greek life at Emory but to create Emory Greek life, to bring the ethos of this special place into the program," Nair says. "Our students come to Emory seeking the skills to become change agents. Why shouldn't they do that through Greek life experiences, athletics, through anything they do at Emory?" The recent work of the Sexual Violence Prevention Visioning Task Force, a multidisciplinary alliance of Emory faculty, staff and students along with behavioral scientists and experts in violence prevention from the U.S. Centers for Disease Control and Prevention, is a prime example of harnessing the power of campus resources. A report from the group is expected this fall, he notes. "Campus Life alone can't eradicate sexual violence," Nair says. "We have to utilize the skills and talents of all community members." That philosophy will also benefit students in the newly constructed Raoul Hall — the latest in half-a-dozen first-year living-learning communities incorporated into Emory's residence halls — which opens this fall with an emphasis on social entrepreneurship. Named after Eleonore Raoul, the first woman to graduate from Emory Law School and a lifelong supporter of equal rights for women, Raoul Hall will help students explore solving societal problems through creativity and innovation, employing organizations, faculty and community representatives, and educational opportunities. Since 2006, Emory has opened new residence halls under a long-term freshman housing plan that links academic and residential experiences in living-learning communities rooted in themes such as citizenship, sustainability, leadership and creativity. Raoul Hall is the sixth and final installation in that plan. "The idea is to engage students in innovation and risk taking," Nair says. "One of our goals is to help our students understand that failure is okay and that it often leads to growth and new ways of knowing. Being okay with failure, though, is a tough lesson for Emory students." Expect to see even deeper integration of faculty, graduate and professional students into Emory's residential living and learning communities, he adds. For example, Nair points to plans to institutionalize a "student experience fund," intended to provide financial assistance to students who can't afford to participate in some student programs, he says. Emory students will also notice increased late-night program and dining opportunities on campus offered as "community-building alternatives to social events that may focus around alcohol, but can still be a ton of fun," he says.